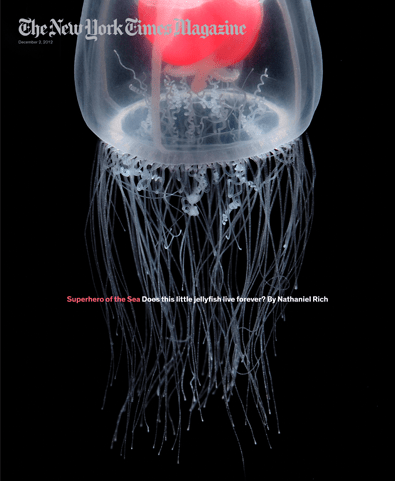 Ageing isn’t a disease, and lifespan extension will be almost impossible to prove in humans. These are the words of the NIA officials and some of the scientists. Aging is not considered to be a disease at the moment. There is no such indication as aging, therefore one can’t register a geroprotector drug, the one that slows down aging. This is one of the major hurdles in aging research. Even though there are some substances that are proven to slow down aging and protect from diseases, researchers can’t make drugs from these substances. This has to be changed if we want to live longer and healthier. I think it’s horrible that the NIA people are propagating this idea that aging is not a disease. They are rejecting the opportunity with their own hands. If they fought for persuading the healthcare officials to accept aging as a disease, a lot of problems would be gone instantly. Firstly, it would be much easier to get grants for aging research. Now everyone has to come up with the potential impact on treating the pathologies like cancer and diabetes, but once aging is recognized to be a disease, it would be much easier to apply to funding. Secondly, research would be more effective, all the scientists now working on separate age-related diseases wouldn’t need to shift their attention from the actual cause, they would be able to focus on the aging processes with no harm to the future funding opportunities. Lastly, there will be aging doctors in the clinic. Right now one can’t come to the hospital and say, “doctor, I’ve got a problem, I am aging.” People would laugh at such a patient, however this is the best kind of patient, the smartest one, one who cares about his future and wants to prevent the upcoming illnesses and frailty. Most importantly, there is a way to help patients like that. the article says “lifespan extension will be almost impossible to prove in humans.” I believe this is wrong. The right panel of aging biomarkers will do the trick. Yes, the panel will be huge, we would need to monitor a lot of parameters (proteomic, transcriptomic, metabolomic data, etc. ), watch the dynamics, but after some time of monitoring, we’ll be able to prevent diseases and make truthful predictions regarding the rate of aging of a particular person. It has already been shown. Read the story of Michael Snyder from Stanford University who was able to track the onset of his type 2 diabetes and treat it, way before the traditional diagnostics could detect the illness. Dr. de Cabo is right, however it is absolutely not clear to me how these researchers are going to change the existing attitude without making aging recognized as a disease. I believe it’s NIA that has to be the leader in persuading the government to change the nomenclature and include aging in the list of diseases. Instead, they are hiding their heads in the sand. And in the meantime we are not getting any younger. “Don’t think you’ll ever get old?” – This is how the article in Wired starts. It explores the difference in people’s savings behavior depending on if they associate themselves with their future selves or not. 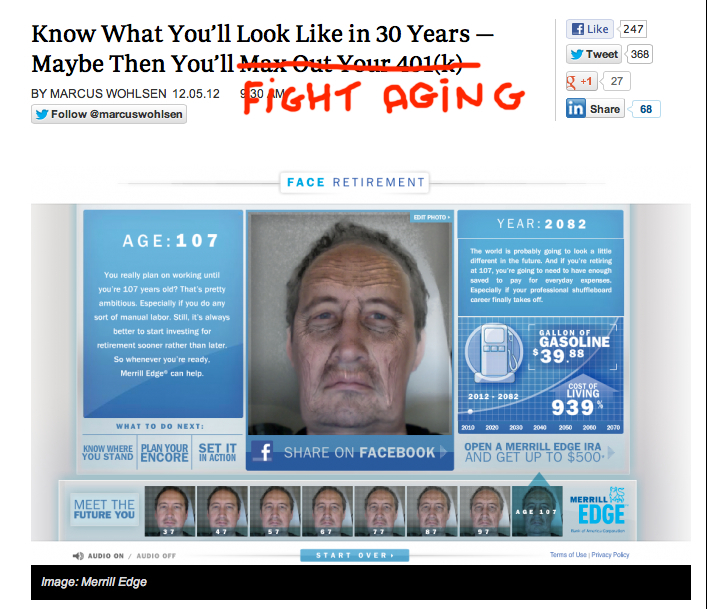 I believe it’s very relevant not only for retirement plans, but also for fighting aging. There is a study done by Stanford researchers that shows that people don’t save now, because they don’t think they will become this old person in need one day. There is no emotional link normally. However, this perception can be changed. The researchers immersed test subjects into a virtual reality simulation that showed them a computer-generated vision of themselves at retirement age and then asked them questions about money. The study found that “those who interacted with their virtual future selves exhibited an increased tendency to accept later monetary rewards over immediate ones.” In other words, they were willing to save more. And in other words – this could potentially motivate people to fight aging, be proactive in their health issues, become more informed about the latest technologies of life extension and give away their money for longevity research. Perhaps, we could start building these bridges in people’s minds that they won’t always be healthy, productive and good-looking. This is hard, because a person needs to interact with their future self, associate with them in order to change their attitude and behavior. But we can definitely start with this exercise, I mean, the web tool that “ages” your picture. There are plenty of these tools on the Internet. They could be incorporated into fighting aging related websites, for example, and become a necessary first step for the visitors. I know this is a slippery slope, however, since this is an exercise, a test, we can always switch back if the audience is not receptive. I would love to hear your opinions on this.